X-COM: UFO Defense (aka UFO: Enemy Unknown, or often just "X-Com") is regarded as one of the all-time classic videogames. IGN rated it as the best PC game of all time in their 2007 list of favorite games. Even so, the X-Com franchise as a whole is plagued with mediocre sales, tepid reviews and general apathy from gamers who continue to rave about the original almost 15 years after its release. This strange dynamic underscores one of the great mysteries in the modern gaming world: What is X-Com's secret to success? Today, X-Com is held aloft as an example of inspired game design. However, it was initially more of a sleeper hit than a blockbuster. Nick Gollop remembers the early days of X-Com. "When Julian [Gollop] went to show the game at MicroProse UK he had a good reaction. However they wanted the game to be more ambitious. They said they wanted a 'Big Game' like Civilization and also one which people could relate to in some way, again like Civilization." Instead they got X-Com. They weren't even really sure what to do with the game once they had it. "Although the game was being published by MicroProse I don't think the advertising [budget] was very much, as I don't think anyone expected the game to be quite the success that it was." The X-Com formula was full of strange contradictions. It mixed real-time base management, turn-based combat, science fiction, a near-future setting, conspiracy theory as a theme and believable, likable characters into one game. This blend of gameplay elements was untested, and the game was only moderately popular in the U.K. It was a different story in the U.S. X-Com was released right when the X-Files television program was becoming popular. Coupled with the release of a gameplay demo, X-Com became an unexpected success. "At the time we were looking in the strategy game newsgroups on the internet, and we noticed more and more people talking about the game. This word of mouth effect from game players also had an effect on the success of the game. At one stage, with the release of the game in the U.S., around one in every two posts on the strategy newsgroup seemed to be about X-Com." The X-Com phenomenon was borne of a couple of guys pitching the right formula to the right publisher, for the right audience at the right time. 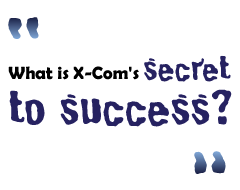 Perhaps the success of X-Com was really just an accident. Players eager to experience more X-Com gameplay snapped up X-COM: Terror from the Deep (TFTD), the second game in the series. They quickly realized TFTD was the same game with new graphics. Players criticized MicroProse for churning out a hurried sequel, but MicroProse had actually put their plans into motion before the original game became a hit. According to the Gollop brothers, "MicroProse UK wanted another sequel done immediately ... so they persuaded us to license the code to do Terror from the Deep. ... We agreed to this deal before we really knew how successful the game was going to be in the U.S., and in retrospect I think this was a big mistake at the time. Terror from the Deep was practically the same game but larger, harder and maybe the tactical missions were not as focused as the original game."